Founded in 1995. We have been serving communities throughout Texas ever since. Wholesale and retail meats and cheeses with bold, distinct tastes. Traditional small-town service with the best selection of flavors from around the world. We specialize in USDA Prime beef and Grade A pork. The best Texas barbecues serve the best Texas meat. Top smoked deli meats and cheeses. Makers of Holy Smoked Sausage! Traditional Old World flavors with a Texas twist. New World and American sausages crafted with care for bold tastes. Top graded chicken and turkey. Whole, cut, sliced. We prepare poultry for fresh or frozen delivery. Seasoned and smoked turkey and chicken. Hot wings, ready to cook and serve. All WB&PP product selection are 100% Made in the USA. We support American owned business. We support serving the best. Waco Beef & Pork Processors specialize in top selection for all restaurants, delis, diners, food trucks, event centers, hotels, and other commercial kitchens. Bulk and wholesale supply prepped for efficient cooking. Smoked meats ready to slice and serve. Pre-sliced or individually prepared items to meet your food service needs. Waco Beef & Pork Processors specialize in catering to the needs of individual diners. Caterers, event organizers, and even the home chef – we customize and personalize special orders for individual items or unique batches. Individual special orders for any home table. Follow a family recipe. Prepare special orders for your family’s special eating needs. Waco Beef & Pork Processors process and distribute bulk meat cuts, packaged or prepared for individual retail sale. Groceries, convenience stores, deli counters, and food production facilities. Bulk and wholesale supply ready for easy unpacking, storage, and individual distribution. We care about your business and getting to know you. Waco Beef & Pork Processors: traditional butcher shop dedication, delivering best processed meats and cheeses. Grass-fed meats available by special order. 100% certified USDA organic meats available by special order. All Waco Beef & Pork Processors meat that is smoked in-house is hickory smoked in our custom smokehouse. Hickory is known for its clean, intense smoky flavor. A top wood for smoked turkey and Old World style sausages. Each product is smoked for an individualized amount of time based on weight of the cut and the desired flavor. We customize everything we do. We smoke and cure meats according to traditional recipes. Specialty blends of seasonings enhance natural flavors. Experienced smoke-masters to bring out the best: Waco Beef & Pork Processors. Over 120 years of combined meat processing and sausage making experience, our experts know everything about Old World flavor. We bring the best flavors from Europe to the New World and provide them with our own unique twist of Texas taste. Family-owned and locally-operated, we have a network of suppliers that extends throughout Texas and beyond. We work with the highest qualified, most reputable local meat suppliers to bring Texas diners the highest-quality US meat. For more than 35 years, we’ve been making sausages. Our award-winning sausage master Michael Landsfeld (Owner and Manager) studied under authentic German and Czech sausage masters. After four years of training, he was declared ready to teach other butchers how to make traditional Old World sausages. Over the years, Michael has perfected the balance between quality ingredients and patient persistence that it takes to make best sausages. A dedicated instructor in sausage making for years, Michael brings a love of instruction to our team, personally training each sausage maker. Working together, our specialty meat processors develop our sausage making techniques and recipes. Sausage is a science and an art. Our sausages truly make a statement. We want you to say “Holy smoked sausage!” with every bite. 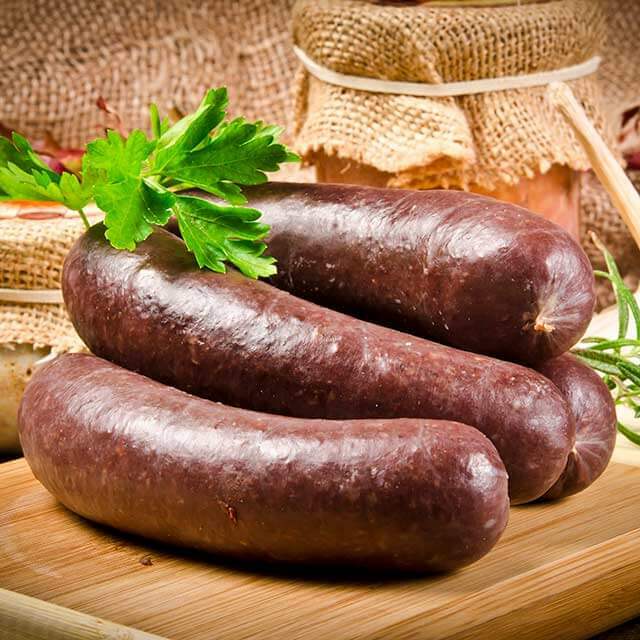 Waco Beef & Pork Processors: Makers of Holy Smoked Sausage! and the best local meat supply. Butchers with heart. For over 35 years, our sausage-masters have practiced and perfected their craft. The best selection of fresh and smoked sausages in central Texas. Award Winning Smoked Sausage. 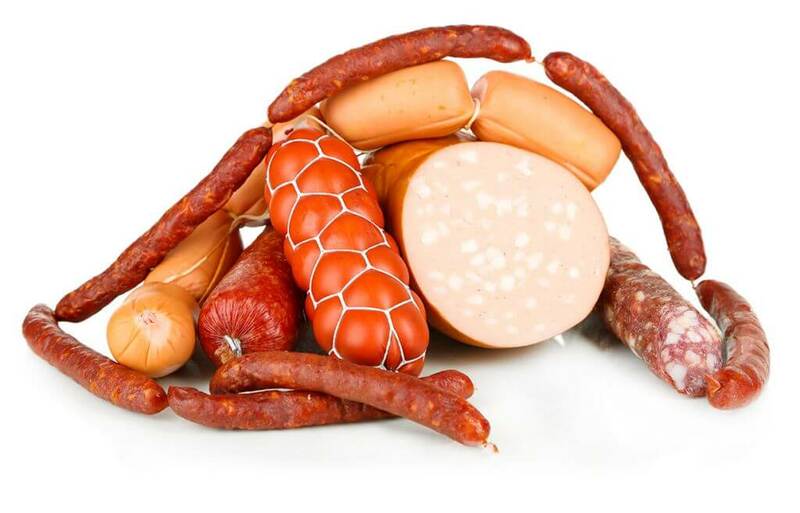 Premium Ethnic and Artisan Sausages. 100% Made in the USA. Makers of Waco’s own Holy Smoked Sausages! Simpler is better. Our labels are easy to read. Our ingredient lists are short and sweet. Natural salts and spices. No preservatives and additives. Best quality meat for best tasting sausage. USDA Select or Choice grade beef. The finest all-natural hog, beef, and sheep casings. No synthetics or preservatives. Specialty batches of beef or pork sausage by special order. Try your own family recipe. Create a one-of-a-kind gift or holiday meal. Flavored with garlic, black or white pepper, coriander, or caraway, and other regional seasonings. Waco B&PP specializes in premier artisan Klobasa. Best summer sausage in central Texas. Our traditional Czech recipe: smoked pork, flavored with regional and traditional Czech spices, pepper, and garlic.. Beef seasoned with pepper, salt, and garlic. Bratwurst. Knackwurst. Frankfurter. Knockwurst. 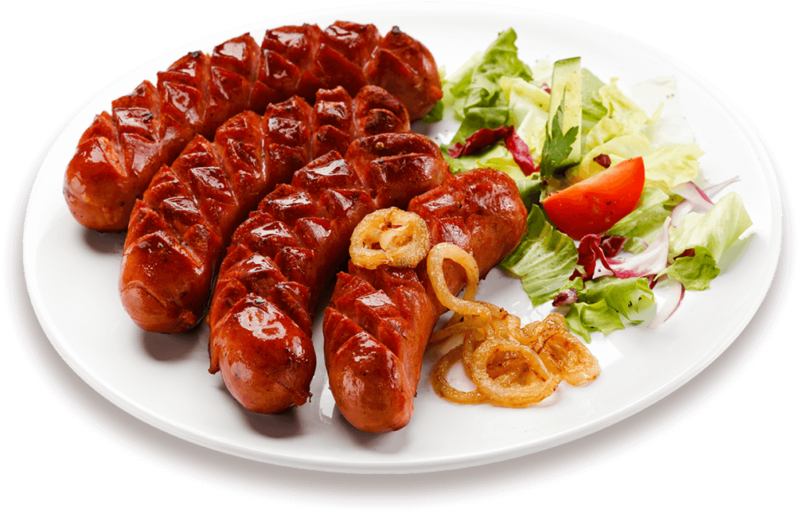 We offer classic German hot dogs and smoked hot dogs. Sweet and spicy, coarse-ground pork seasoned with Italian spices like fennel and anise. Pork sausage patties or links flavored with black pepper and sage. Finely ground, smoked pork spiced with red peppers. Creole spices, bold flavors of Louisiana in central Texas. Unbeatable selection, including seafood Cajun sausage. Boudin: fine-ground, smoked and spiced pork, with rice, peppers, and onions. Andouille: spicy, double-smoked pork sausage. Spicy pork and beef sausages in varying sizes. 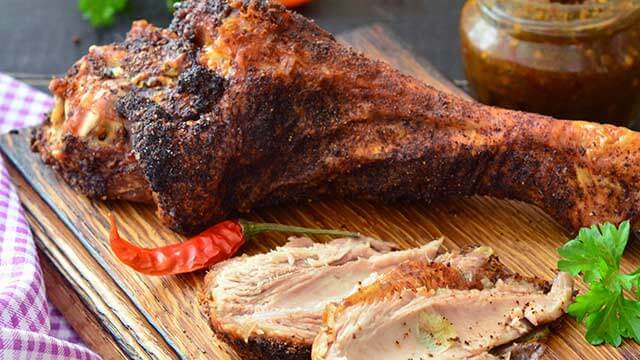 Mild and spicy pork, ready to serve. Smoked pork perfect for the barbecue. Every sausage should be flavorful. Specialty, fine-ground chicken sausage patties and links. Top central Texas selection of smoked sausages with flavors from around the world. We always use hickory wood to smoke our meats. Hickory wood gives a clean, intense smoky flavor. Beef: Brisket and Prime Rib Roast – Award-winning smoked brisket. 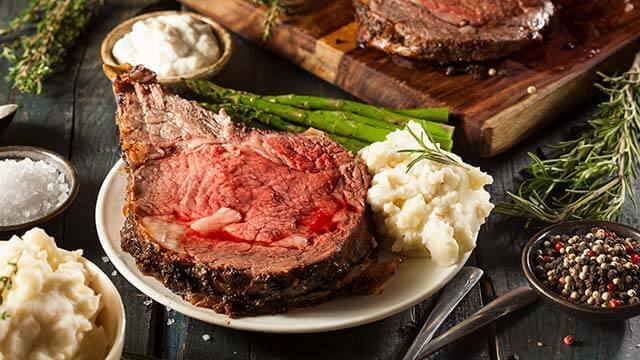 Tender and buttery prime rib roast. 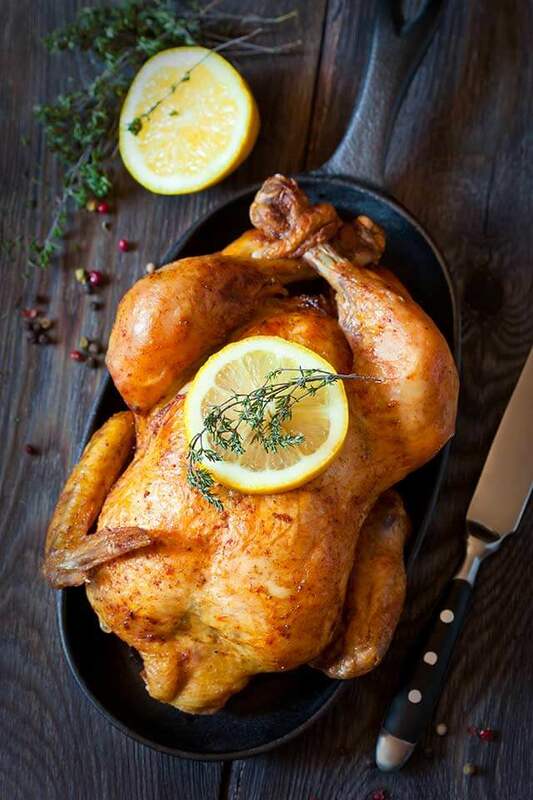 Turkey: Legs and Breast – Smoked whole turkeys, as well as smoked turkey legs and boneless turkey breasts. 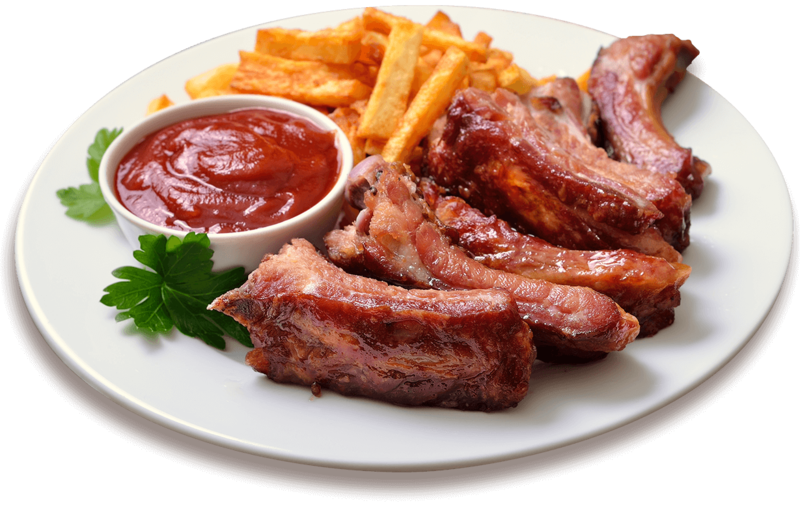 Pork: Bacon, Ribs, Ham – Mouthwatering Applewood smoked bacon. Smoked ribs and pork belly. Whole and sliced smoked hams. Specialty: Beef Jerky, Ham Steaks, Cottage Ham – We smoke and cure specialty meat sticks and beef jerky with our own blend of salts and spices. We offer a top selection of ham steaks and cottage ham, ready for your kitchen’s special touch. 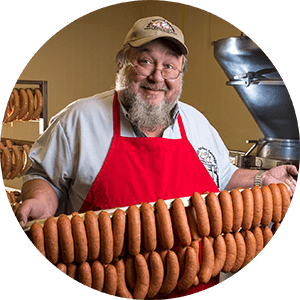 Sausages: Old World and New World Flavors – Of course, we make the best smoked sausage in central Texas. Holy Smoked Sausages! Planning a large event or catering a party? We can help. We offer the best smoked meat selection for catering services, corporate events, specialty menus, and commercial kitchens. Need a specific recipe or specialty ingredient? Give us a call. We process special orders of smoked and cured meats. Follow a family recipe for a large family event. Create a unique corporate gift or dinner. Waco Beef & Pork Processors: Best smoked meat selection for catered events, restaurants, and every table in central Texas. In Texas, we love good food. Restaurants. Special events menus. Catering services. Delis. Diners. BBQ joints. Rib shacks. Food trucks. Hotels. Sports venues. No matter what kind of commercial kitchen, Waco Beef & Pork Processors is prepared. Fresh or frozen meats in bulk. Seasoned and cured meats. Whole or cut. We pre-slice or pre-season meats for easy kitchen preparation. We pre-slice or pre-grate cheeses for easy kitchen use. Waco Beef & Pork Processors: Best wholesale meat and cheese selection in central Texas. Unbeatable service, quality, and value. We are based at our private smokehouse and top-of-the-line processing center in Waco, Texas. Our professional team of drivers delivers to clients and event venues throughout Texas. Our customized refrigerated trucks have the industry’s best shipping technology, ensuring meat is kept at ideal temperatures to reach your kitchen ready. For specialty and rush orders, we offer same or next day delivery whenever possible. We care about your business. We care about what you need. If you need something immediately, we care about getting it to you. Looking for commercial and restaurant snacks? Top quality and best tasting. Easy to prepare wholesale meats and cheeses. Sausage on a Stick: Our award-winning sausage makers have created these fun and tasty treats. Cheese Curds: Top Wisconsin cheese curds ready to bread and fry for cheesy goodies. Pre-marinated Fajita Chicken or Beef: Specialty cuts of chicken breast and flank steak, seasoned with custom blend of fajita spices. Ready to cook and serve. Beef Jerky: Seasoned and cured beef strips and meat snacks, homemade with care and dedication. Ready to snack or serve individually. Waco Beef & Pork Processors: top commercial and restaurant kitchen wholesale meat suppliers. 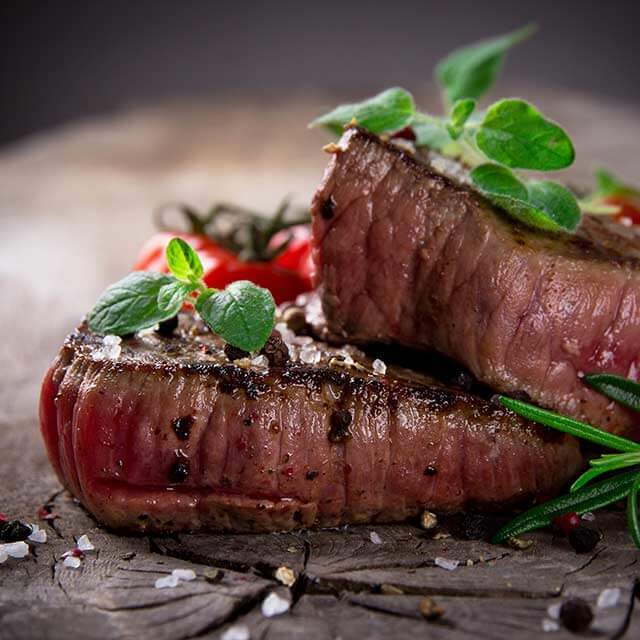 Top grade fresh and frozen cuts of beef for Texas restaurants, groceries, and caterers. Tender, mouthwatering steaks. Commercial primal and subprimal cuts and fine butcher restaurant cuts. Award-winning Texas butchers with over 120 years of combined experience: Waco Beef & Pork Processors. USDA Prime is the highest grade of beef. It is younger beef, with thorough marbling, prepared by top butchers. USDA Choice Beef is the most common beef. Choice beef is matured beef, with good marbling, prepared by trained professionals. We specialize in all cuts of USDA Prime and Choice beef. We provide USDA Select beef by special order. Top certification from the best brand. 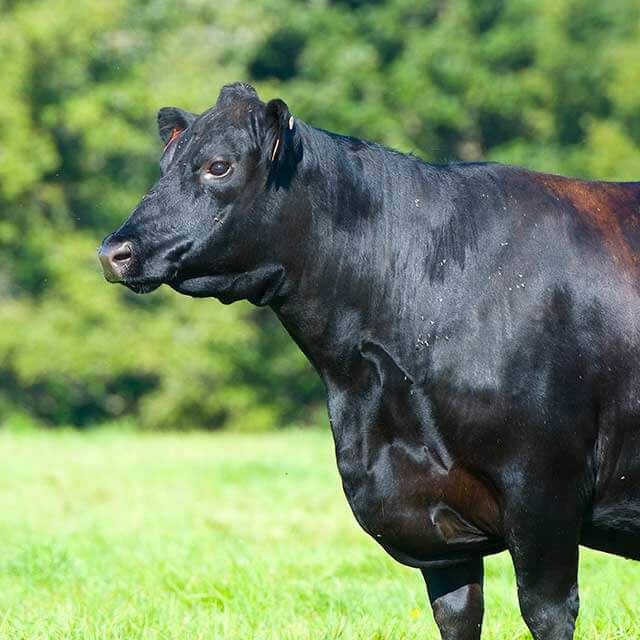 Certified Angus beef passes over 10 criteria before receiving an official seal. 100% certified USDA organic beef selection available by special order. Kosher beef available by special order. Top beef short ribs for barbecues across central Texas. Fine and coarse ground beef from various recipes. Customized ground meat and fat ratio. Top lean ground beef full of flavor. Many gourmet recipes call for top quality, specialty variety meats. Organs, tripe, tongue, oxtail, and more. Custom and special orders of beef trimmings. For the finest restaurant selection of Old World and New World smoked sausages. We specialize in Old World ethnic sausages. Crafting artisan flavors from traditional recipes, with a Texas twist. 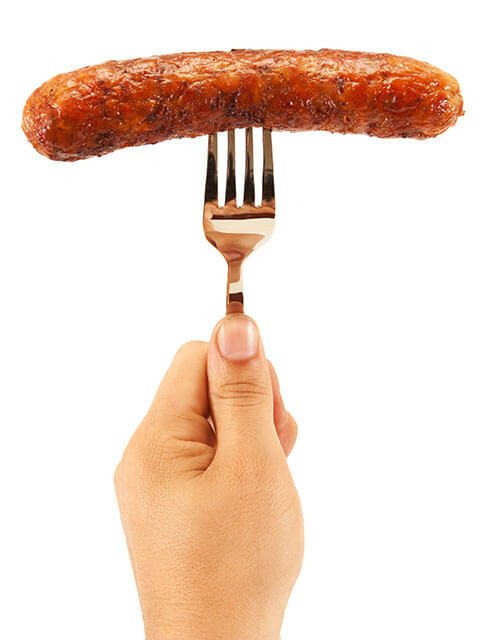 Bulk and wholesale sausage-on-a-stick available. Sausages in both patties and links. Our recipes are based on training with European sausage-masters. We learned their traditional Czech, Polish, and German mixtures and based our premier sausages on centuries-old techniques and time-honored flavors. We gladly discuss wholesale special recipe orders. Customize a batch of fresh or smoked sausage with a different recipe. Craft your own flavor combination. Top grade fresh and frozen cuts of pork for production or preparation. Commercial lean cuts and fine butcher restaurant cuts. Top pork spareribs for barbecues across central Texas. We offer all the top commercial cuts of pork for Waco restaurants, commercial kitchens, and groceries. Fine and coarse ground pork ready for your favorite recipe. Perfect for sausage production. Many gourmet recipes require specialized cuts of pork meat, including organs and trimmings. Pig’s feet, jowl, skins, chitterlings, heads, hog maws, and more available. Chicken and turkey are everywhere in the American diet. The most popular common menu items. The most requested dishes. Waco Beef & Pork Processors offers an extensive selection of chicken and turkey. From whole birds to specific cuts for your favorite recipes. Putting the best poultry on tables throughout central Texas. Fresh and frozen. Hand-selected birds. Top quality. Chicken Halves: Divided into left and right halves. Chicken Wings: Whole or cut wings. Pre-prepped bulk hot wings, “lollipop” wings, and party wings. Chicken Legs: Whole legs including drumstick and thigh. Drumsticks and thighs also sold separately. Boneless, Skinless Chicken Breasts: The most popular white meat in America. Standard breasts are boneless and skinless. Breast meat available with skin. Offered sized or random. Chicken Breast Tenders: Often breaded and fried or baked to serve. Seasoned by special order. Restaurant quality. Chicken Giblets: Fresh or frozen. Chicken hearts, livers, gizzards. Customize your order for bulk giblets. Supplier to top BBQ restaurants known for delicious chicken. The best fresh and frozen turkey selection in central Texas. Whole Turkeys: Prepared for commercial processing or cooking. Turkey Legs: Drumsticks, whole turkey legs, and boneless thigh meat. Boneless Turkey Breasts: Separated, grocery or restaurant ready. Boneless sliced turkey tenders ready for turkey jerky. Waco B&PP: one of the few central Texas meat processors to offer Grade A ground turkey and chicken. Enjoy the finest selection. Quality you’re proud to serve. Best bulk cheese for restaurants and commercial kitchens. A range of flavors to complete any menu. Catering, special orders, deli specifications. Waco Beef & Pork Processors: top variety of flavorful wholesale cheese throughout central Texas. We offer whole bricks or wheels of cheese. Sliced or grated cheese. We welcome special orders of American cheeses. Colby Cheese: A sweet, soft yellow cheese. Serve in slices or entrees. 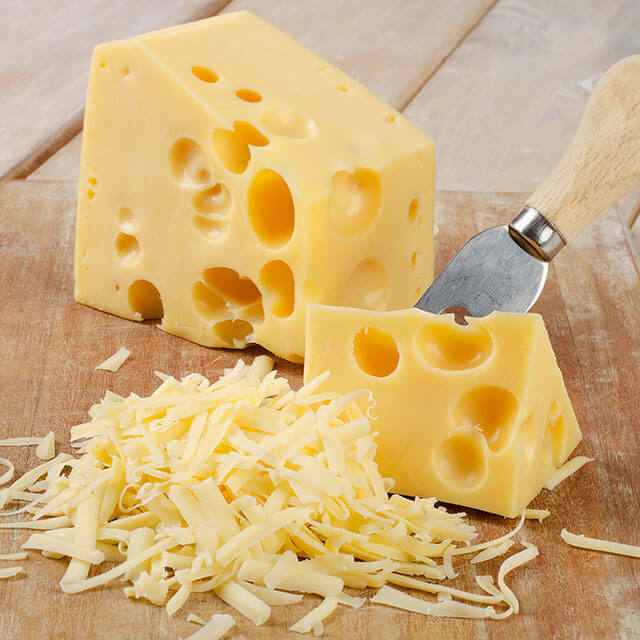 Brick Cheese: Mild and sweet, a soft yellow cheese. Cheddar Cheese: Mild, sharp, and extra-sharp flavors. White and yellow. Smoked cheddar cheese pairs perfectly with barbecue. Mozzarella Cheese: Soft and moist, a sweet white cheese. Serve fresh or preserved. 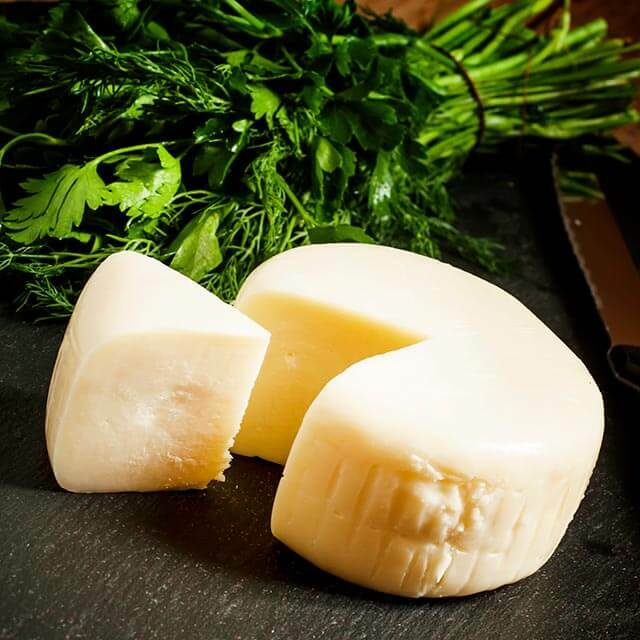 Provolone Cheese: Soft and sweet, a medium white cheese. Serve sliced or in entrees. Mild and nutty, a medium yellow cheese. Serve in slices or entrees. Sausage making supplies from award-winning sausage masters. 120+ years of experience in sausage production. Members of the American Association of Meat Processors and Texas Association of Meat Processors. Bringing you the best: Waco Beef & Pork Processors. 100% American, all-natural casings. Beef, pork, and shep. Certified organic casings available by special order. Edible hog casings ready to be cured and smoked. Fresh preserved in multiple diameters. Non-edible beef casings. Smoke or cure. Preserved for freshness. Multiple diameters available. Edible beef collagen casings available by special order. Natural sheep casings for smoking or curing. Multiple diameters available. Put something special on every table during the holidays. Waco Beef & Pork Processors offers the finest selection of smoked meats for every holiday on the calendar. From traditional Easter ham to specialty smoked brisket and sausage recipe – we can help you put together a dinner to remember. Everyone gets in the holiday spirit. We understand. Waco B&PP supplies the best holiday specialty meats to commercial kitchens throughout central Texas. Create a specialized holiday menu. Call Waco B&PP. We help put the best holiday feasts on every table. Smoked Prime Rib: The best cuts of USDA Prime rib, seasoned with our special recipe and smoked individually to perfection. The most savory flavor at any holiday table. Smoked Whole Turkey: Smoked whole turkeys from large to small, with specialty seasoning and preparation for the season. 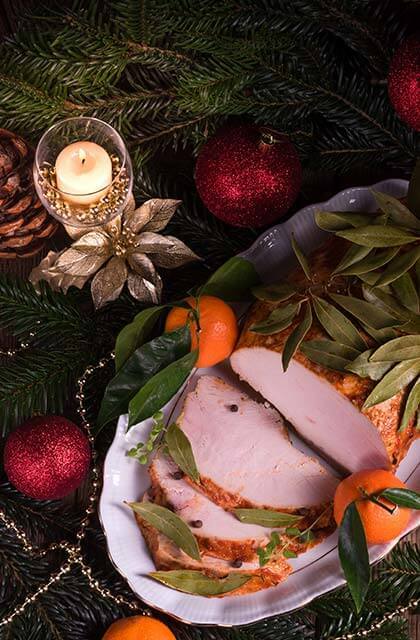 Smoked turkey breast and legs available for commercial kitchen specialty holiday recipes. Smoked Bone in Ham: Fresh and frozen smoked bone-in ham. Specialty cuts of honey cured ham. Spiral cut ham or boneless ham, prepared for your holiday table. Smoked Brisket, Sausage, Chicken, Applewood Smoked Bacon: A range of special occasion and holiday smoked meats to suit every celebration. Award-winning smoked brisket. Specialty spices and years of dedicated experience that create a one-of-a-kind taste. Holy Smoked Sausage! 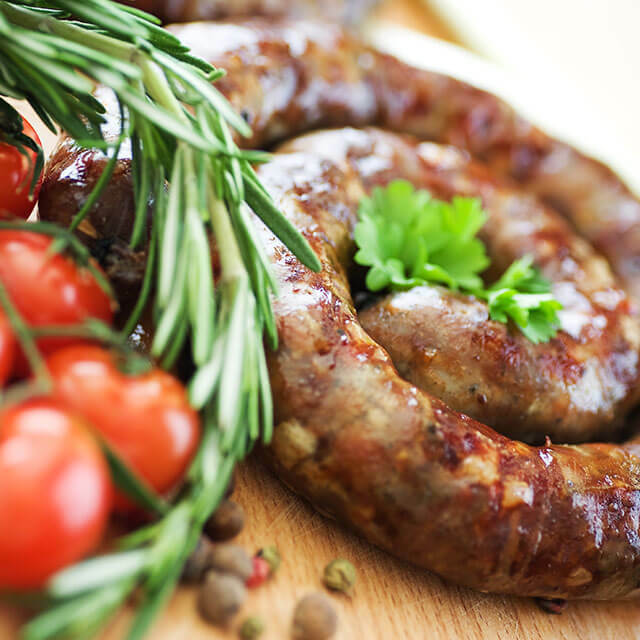 brand sausages: Award-winning taste of the Old World and New World in a wide variety of sausages. 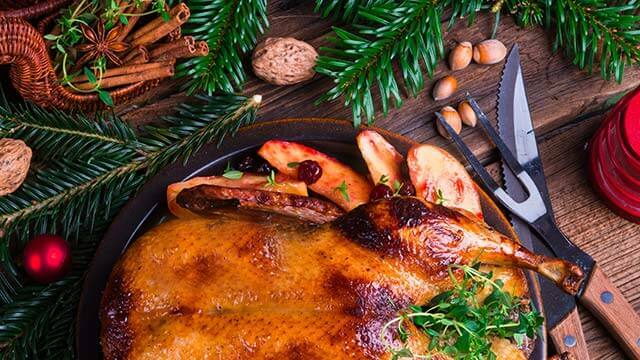 Specialty smoked chicken, bacon, pork belly, catfish and more for holiday meals and recipes. Specialty Orders Welcome: Celebrate with a perfect holiday or special event meal. Customize your holiday menu. Specialty cuts and preparations available by request. Specialty batches of special or personal recipes by special order. Whatever specialty smoked meats your holiday recipe calls for. No matter the number of people you plan to serve. All meats 100% American. Prepared with all-natural seasoning. No MSG. Best specialty holiday smoked meats selection in central Texas. 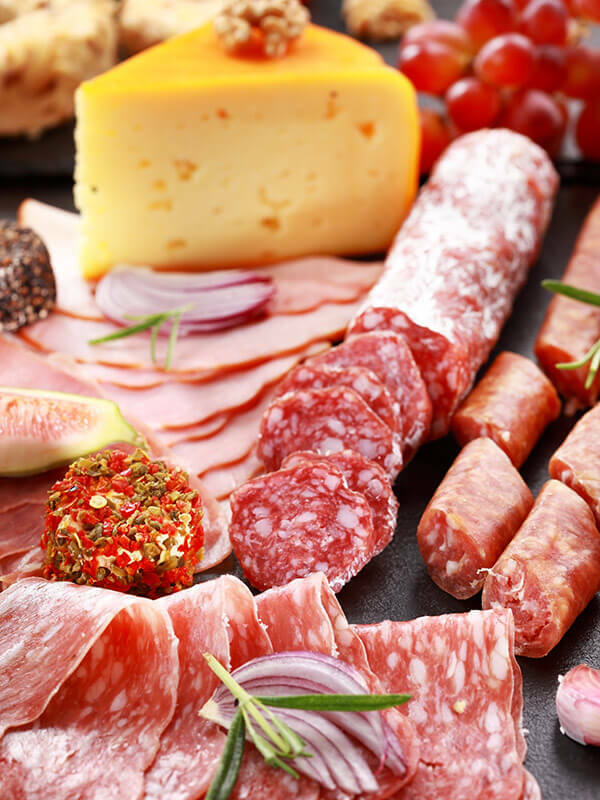 Order whole, uncut deli meats and brick cheese, for your kitchen to cut in-house. Deliver top quality and taste in every bite. Order pre-sliced deli meats in your preferred thickness. From shaved to thick. 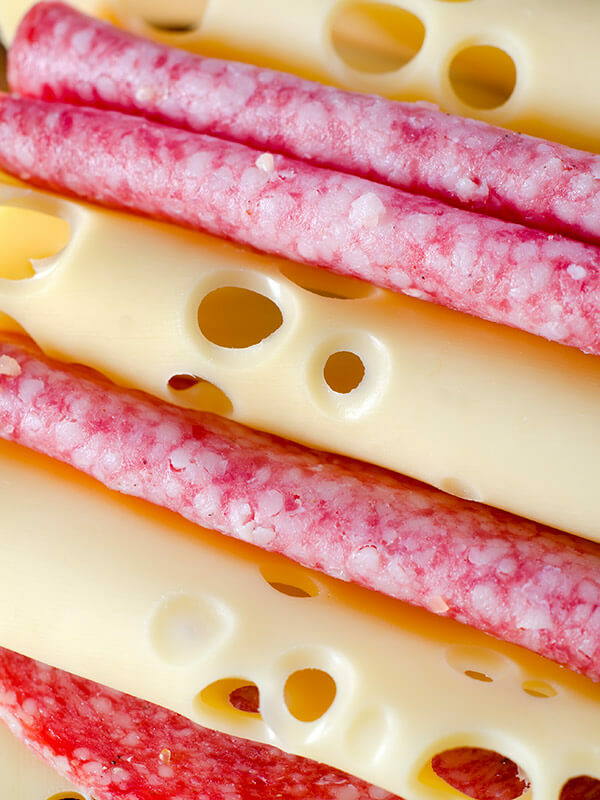 Our gourmet cheese can be ordered pre-sliced or pre-grated for your convenience. Custom and unique recipes available by special order. Kosher deli meats available by special order. The best selection of genuine Wisconsin cheese throughout central Texas. Ready to serve at your deli or restaurant. Bulk orders for individual retail sale. Enjoy top artisan cheeses from across the country. Perfect for every table. Cheese Blocks. Cheese Wheels. Smoked Cheese. Fresh, aged, and smoked cheeses. White and yellow. Award winning cheeses, available in blocks or wheels. Wisconsin makes the original Colby cheese. Sweet. Mild. Rich. Enjoy genuine American cheese taste. An essential deli counter snack, cheese curds are a tasty treat. Serve fried or baked. Or use cheese curds in many delicious recipes. We also package cheese curds for individual retail sale in groceries and lunch counters. Roast Beef: Best cuts of beef roasts, including prime rib, eye of round, and top round roasts. 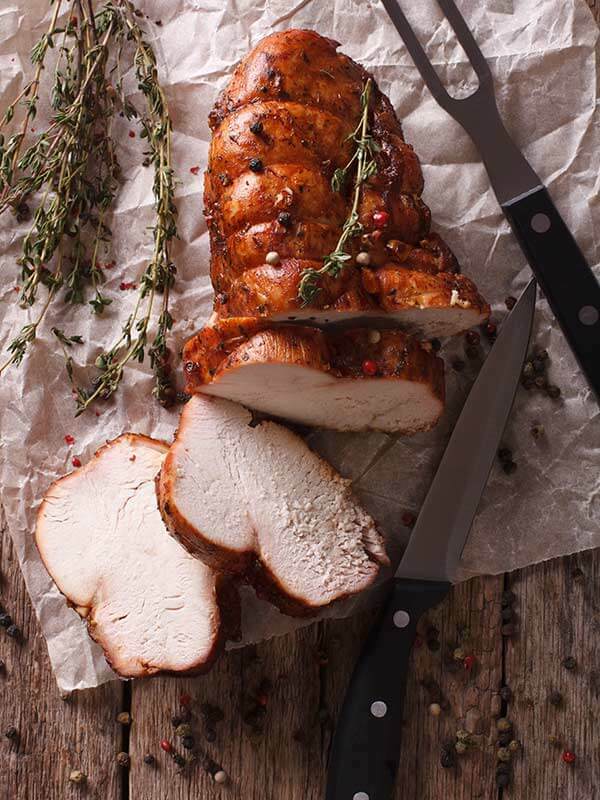 Smoked and Roast Turkey: Tender and flavorful whole smoked turkey and roast turkey breast meat. Cured Hams: Sweet or spicy, deli ham is delightful. Best Black Forest Ham, boneless, boiled, and honey ham. Authentic Capicola and Prosciutto. 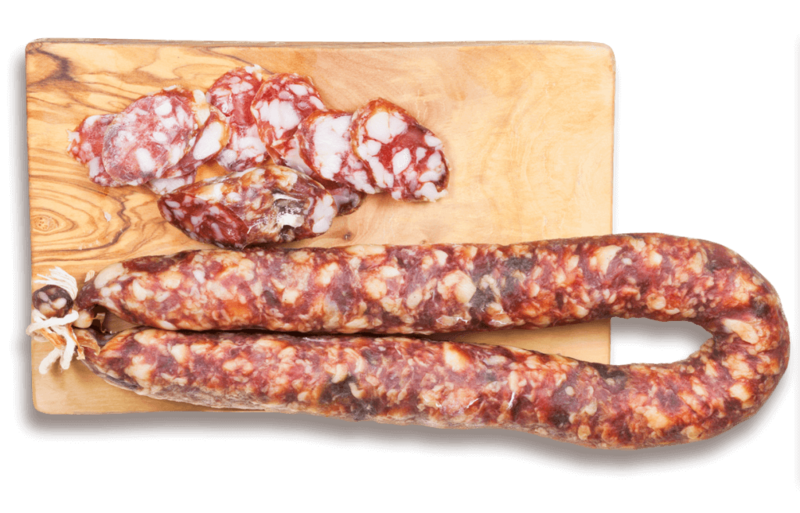 Deli Sausage: Award-winning sausage masters offering best deli sausages, including salami and pepperoni. Head Cheese: Classic deli counter lunch meat. Authentic beef or pork head cheese offers authentic European flavor. With flavors from around the world. Brought to you with a twist of Texas. We offer selections from Selective Seasonings and A.C. Legg’s Old Plantation seasoning. Our favorite spice blends, with something unique. You can try other seasoning blends, but you won’t find anything quite like these. All natural dried herbs and spices. Traditional recipes with a Texas twist. A taste of the Old World blended with something truly new. We make the top BBQ spices mix in central Texas. Sweet. Spicy. Savory. Real taste of barbecue. Specialty beef jerky seasoning. Combination of top salts, peppers, and herbs to give every piece a Texas kick. BBQ rubs and seasoning for ribs, steaks, burgers, and BBQ roasts. Flavor your chicken and turkey for the tastiest celebration. Specialty mixes for any occasion. Specialty blend including pepper combinations. Makes tender, flavorful turkey breasts. Top spice blend for BBQ chicken, available in bulk. Ethnic Flavors from Around the World. Top sausage seasoning recipes from award-winning sausage masters. 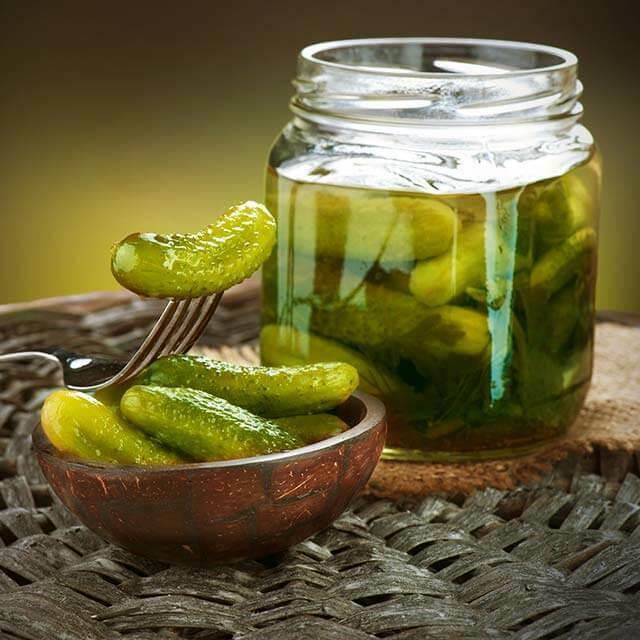 Waco Beef & Pork Processors offers a top blend of seasonings commonly known as “pickling spice.” Added to brines, it’s crafted for enhancing the flavors in any pickled meats, cheeses, or vegetables. Bold specialty blends: Waco Beef & Pork Processors seasonings. Waco Beef & Pork Processors offers the finest quality specialty order meats available. We care about helping you serve your customers or guests the best meal possible. Farm raised in Louisiana, our catfish fillet are always 100% US fish. Never imported. We offer fresh, frozen, skinless or with skin. 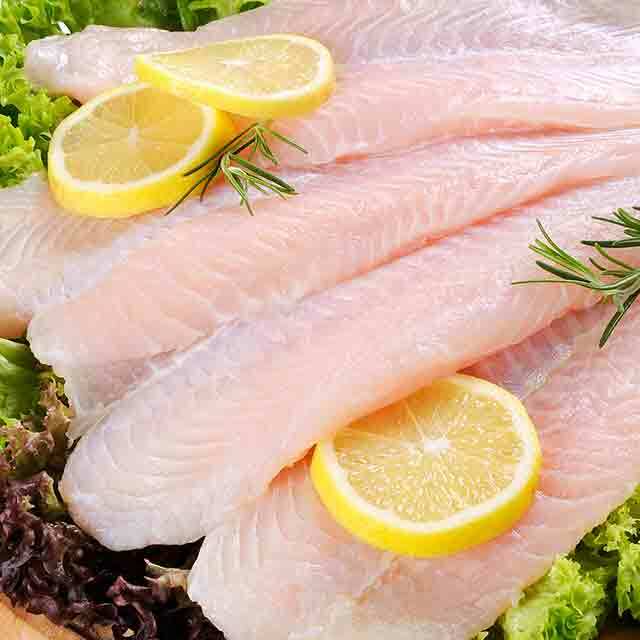 We can also cut and prepare whole catfish to your specifications. Top selection of Grade A Louisiana catfish: Waco Beef & Pork Processors. Veal is a specialty, delicate meat that requires proper care and preparation for top flavor. Tender, buttery, soft. Veal is prepared from the youngest, milk-fed beef. We special order Prime and Choice graded veal cuts. The finest dining for restaurants, special event halls, and home chefs. Select grade veal cuts also available by special order. Waco B&PP: Top Prime and Choice cuts of veal. From Texas farms to Texas tables. Lamb is one of the most popular specialty meats throughout Texas and the US. A tender, flavorful, savory meat prepared in a variety of dishes. Many top BBQ-ers use lamb for amazing barbecue flavors. 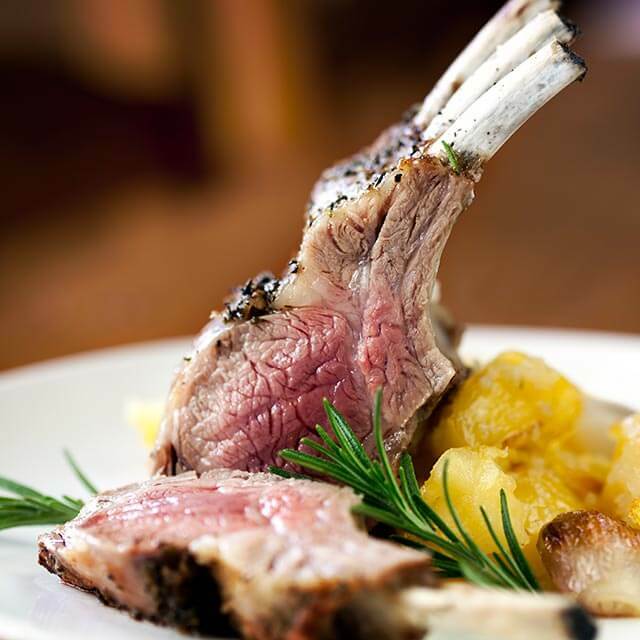 Top cuts of quality lamb from suppliers throughout Texas and neighboring states. We specialize in Prime and Choice cuts of lamb. Waco Beef & Pork Processors: special order top quality lamb throughout central Texas. Many traditional and gourmet recipes include special meat cuts not found in all grocery stores. Waco Beef & Pork Processors offers a selection of the best offal, variety meats, trimmings, and other edible meats. Whole Beef & Pork Heads. For specialty recipes. For traditional tastes. Variety meats to serve at any table. For restaurant preparation. For individual retail sale. Top selection of variety and specialty cuts of meat: Waco Beef & Pork Processors. Top Grade Facilities. Best Standards of Practice. Trained Experts. With over 120 years of experience in meat processing, Waco B&PP butchers are the best. We’ve customized our own system to process meat efficiently and thoroughly. We’ve created a way of meat processing that is different. We simply think it’s better. State Inspected Facilities that exceed standards of excellence for meat processing and preparation. We exceed industry standards for safety, cleanliness, and meat care. Best Practices that exceed industry standards. We take extra steps, extra care, and extra measures to ensure careful handling of the highest quality meats. Our individualized training program ensures every team member knows how we do things. We care about having good systems. Trained Experts who have as much as 35 years specializing in what they do. With knowledge from hands-on and classroom training, from meat sales to animal care, our butchers and meat processors are highly qualified. We love what we do. Best value and taste. Top Texas quality at every table.